Your dog loves it when you pet him, rub his belly, and scratch behind his ears. But dogs, like humans, also love it when you give them massages. While it might seem silly, it’s actually extremely beneficial for your pup. It feels good when you get a massage, right? Well, that feeling is the same for dogs. A massage can relax her and give you another opportunity to connect and bond with your best friend. But those aren’t the only benefits. Stress and anxiety reduction. Dogs can easily get stressed or anxious. It could be a loud noise, a thunderstorm, or the glimpse of a cat. Regardless of the reason, a massage can ease your dog’s tension and relax him into comfort so he forgets about his worries. Healing aid. If your dog has hurt herself, then a massage might be just what the vet orders. Massaging your dog can help to rehabilitate, reduce pain and swelling, heal strains and sprains faster, and keep scar tissue to a minimum. Of course, you should let your vet advise you on how to do this properly and safely first! Improves body functions. A massage can increase your dog’s circulation, decrease blood pressure, improve lymphatic fluid movement, strengthen his immune system, aid digestion, stimulate the kidneys and liver, and encourage deeper breathing. Promotes overall well-being. When humans get a massage, they feel refreshed, balanced, and revitalized. Your dog will feel the same way after you give her a good rub down. Strengthens your bond and relationship. A massage may be a new concept for your dog, but once he realizes how great it feels and that you’re the one making him feel great, your bond and relationship will be that much deeper. With all of the advantages of dog massage, how can you not give it a try? Let’s look at the best way to massage your dog to get the most benefits. You don’t want to massage your dog like you would massage another person. That will most likely be too rough for them and cause adverse effects. Instead, you want to use gentle motions and techniques to make sure she’s comfortable. Here are some steps to get you started on giving her a relaxing massage. 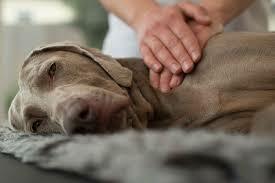 Make sure that your dog is in a calm, submissive state before you begin the massage. While one of the goals is relaxation for your dog, starting when she’s anxious or fearful may reinforce that mental state instead. Try going for a long walk before you start. Start your massage by petting your dog gently all over. While you begin your massage, talk softly to your dog to keep him calm and relaxed. Massage your dog’s neck by making circular motions. Remember to keep the pressure gentle so she’s comfy. Continue massaging down toward your dog’s shoulders. Since dogs can’t reach this area of their body, take a little extra time so he can enjoy it! Move to the chest and front legs. If your dog doesn’t like it when you massage her legs, move on to a different body part. If she does like it, see if she wants her paws massaged too. Be careful with the pads, though. Many dogs have an automatic “kick” reflex to anything touching between the pads on their feet. Massage your dog’s back using circular motions, going up and down on both sides of the spine. Keep gently massaging your pup until you get to his back legs and tail area. Once you finish, he should be totally calm and stress-free. A massage is a great way to get in tune with your dog so you know what’s normal for her. In future massage sessions, you’ll be able to notice any differences in your dog’s reactions, which might alert you to any issues she may be having. So when you get home tonight and you’re sitting on the couch with your pup, give him a massage and see how much he likes it!